1. Hi Rick! We were wondering what a boat owner should to keep his boat well maintained. Enlighten us, please. We recommend regular bottom cleaning and inspections. The bottom, fittings and running gear should be inspected for any damage/problems. Depending on the bottom construction, different boats could have different types of problems. Fiberglass hulls should be checked for blisters, delamination of the fiberglass, stress cracks etc. Wood hulls should be checked for bare areas, soft or rot damage, seam issues etc. 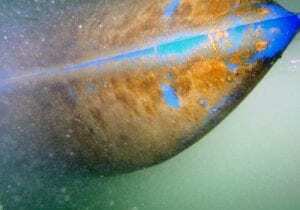 Aluminum and steel hulls should be checked for corrosion issues. All underwater metals are highly susceptible to corrosion (galvanic or stray current corrosion) and need to be inspected and monitored regularly. Anodes or impressed current systems need to be inspected and maintained to be sure they are providing the necessary protection. The other underwater fittings should also be checked to make sure they are secure and not damaged. 2. Got it. So how often do you recommend doing the above? There are several factors that determine the frequency of service. The condition of the antifouling bottom paint needs to be considered as well as the use of the boat. Bottom paint with depleted copper will foul faster and heavier than boat bottoms with newer bottom paint. Racers will want the bottom cleaned before a race. In the summer months, that may be weekly or every other week service. Most cruisers will have a bottom cleaning done once a month or every other month. Minimum service would be every 3 months or so to prevent extremely heavy bottom fouling. Anodes also need to be checked and tightened/replaced as they corrode away. 3. What’s all this going to cost me? Generally, the cost for bottom cleaning will reflect the time it takes to clean the boat bottom. The frequency of service, bottom paint condition, boat size, type of running gear and fittings will all affect the time and cost for bottom service. The amount and type of anodes also affect the cost of bottom maintenance. 4. And what happens if I decide NOT to have my boat bottom maintained regularly? If the bottom is not maintained on a regular basis, many problems can arise which can be simply cosmetic to more structural issues such as corrosion, which can be very costly. Boat performance is improved when the bottom is clean. Slower speed, wear and tear on the motor and running gear is an issue with a dirty, unmaintained bottom and running gear. Thanks for the great info, Rick! 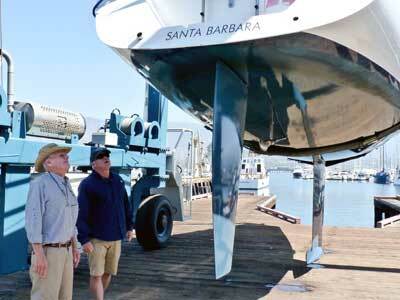 If you’d like to learn more about Salty Dog Dive Service, or any of our other preferred vendors, please visit our Local Services page at http://chandlery.com/boat-repair-services-santa-barbara/. We’ve been in this business for over 70 years and can help you find the right person to solve any boat issue that may arise. It’s what we love to do! We are here to help. Let us know what you need.